Welcome to We Clean Windows - Professional window cleaning Adelaide. We are a group of South Australian Professional window cleaners, committed to providing exceptional service at a competitive price. We are a local business and where possible, you will be serviced by a member from your local community. All our people are security screened and insured. We consist of only competent, well-trained, specialist Window Cleaners. 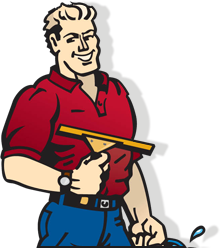 We guarantee our workmanship and use only products and cleaning methods that are time proven, tested and safe. We have been the South Australian market leader in window cleaning for well over 10 years. Some of our window cleaners have over 30 years experience in all categories of window cleaning, here, interstate and overseas. We offer traditional and new window cleaning methods. We are South Australian owned and operated and our immediate response Call Centre operates 24 hours a day and is situated in Adelaide. We service the greater Adelaide metropolitan area, including Gawler, Barossa, Mount Barker and Hills districts. 2019 We Clean Windows fridge Calendars available now.